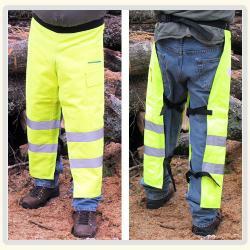 The Forester Safety Green Chainsaw Chaps is great for chainsaw work in areas were visability is a must. The chaps have 2" wide reflective stripes and a side pocket. These have a water and oil resistant oxford outer. With 12 layers of protection, yet lighter weight than other chaps. The 3M company makes the Ballistic Fiberglass Mesh material for us. 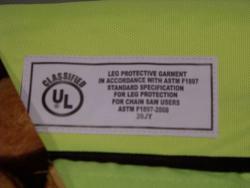 It meets all the new OSHA and ANSI classifications, and they are UL approved. We have 2 sizes of the apron style as pictured (regular and large). We also offer an adjustable full wrap style chaps. The fully adjustable chaps adjust from 35" to 42 1/2". 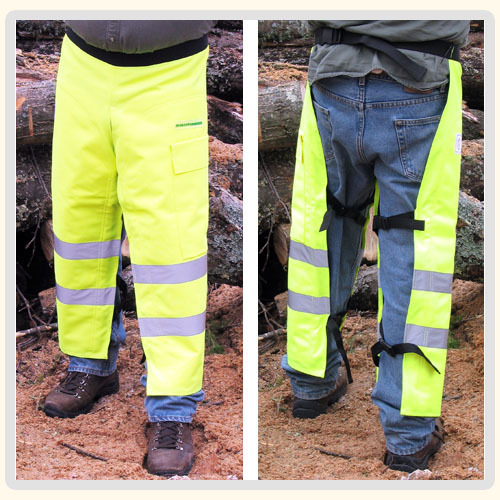 All our chaps have a fully adjustable waist up to 48"
We now have a video demo of our chaps in action at this link: http://blog.discountarboristsupply.com The video was uploaded on January 30th 2011. Yes it is me in the video. Protective leg garmets are designed to reduce the risk of injury to body parts covered by pads, should they come in contact with a rotating saw.